Community members came together at a town hall meeting to discuss the future of policing in Athens. 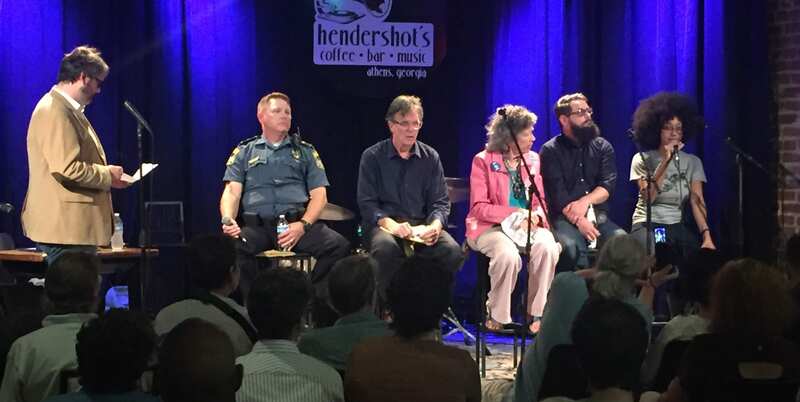 A panel consisting of Interim Police Chief Mike Hunsinger, a UGA law faculty member and local political leaders responded to questions last Thursday and were met with claps, snaps, cheers, and criticism. The event, which was organized by four Athens advocacy groups, gave the community the opportunity to express how they feel about recent police changes, including the departure of Chief Scott R. Freeman. One person absent from the town hall meeting was County Manager Blaine Williams. He’s in charge of hiring a new chief, and the community wants to make sure he has their input. Former Mayor Gwen O’Looney brought up the fact that the mayor and commissioners have “no authority” over the selection of the next permanent chief. She said the only way they could have have a say in the decision, would be to oust Williams, the county manager. Later during the questions, commissioner-elect Tim Denson said he had spoken to Williams who told him he’s open to community input. “He said that he was willing to have a citizens committee involved in the hiring process,” Denson said. We reached out to County Manager Blaine Williams’ office for comment about the hiring process for a permanent chief and whether or not he will be open to community input and have not heard back.